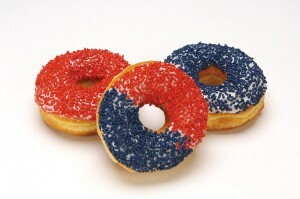 A horse race presidential poll is like a doughnut for breakfast. You crave it, it tastes good… but it’s got little meaningful substance or nutrition. If you want to understand what’s happening in the campaign — and the central role of public opinion research in politics — you need to look beyond the horse race. Of course we understand why people are interested in the horse race: we all want to know who our next president is likely to be! And there are very few easy-to-grasp indicators of who is winning the race (though in our view, fundraising performance, endorsements, delegate count and extent of field organization are relatively undervalued metrics). The media stokes the demand for predictions, and many pollsters are happy to supply the data. But here’s the problem. Polls are not designed to be predictive. Polls are designed to offer a snapshot of opinions at a moment in time. Polls are only predictive if nothing changes — and nobody changes their mind — between today and election day, which is impossible. Unpacking this point a bit… polls on a topic people have not thought deeply about produce results that can easily shift. This is a point Will Friedman of Public Agenda articulates in an excellent recent op-ed. When it comes to politics, many voters change their minds in the days leading up to an election. This is particularly the case during the primaries, when the candidates are still introducing themselves, and few people are paying close attention. Our point here is that the most meaningful presidential polling has nothing to do with the horse race. The most meaningful polling involves efforts to understand the values underpinning voter attitudes and converting them into a coherent campaign strategy. Why? Because in contrast to preference for a candidate, people’s values are unlikely to change over the course of a campaign. It’s the “data underneath” that matters, according to Obama 2008 campaign manager David Plouffe. The most meaningful polling does look at familiarity and favorability as basic measures of a candidate’s potential, but it also seeks to understand which issues matter to voters, how people prioritize these issues and discover what the public considers the most effective means to addressing them. It encourages people to make realistic trade-offs, and it tests a range of messages to understand strengths and vulnerabilities — both for oneself and one’s opponents. It’s the “data underneath” the top-line polling information that matters, as Obama campaign manager David Plouffe put it in August 2008, including an understanding of who the “true undecideds” are, “how they’re likely to break” and what messages will persuade them. Put simply: the most effective political campaigns are built on a foundation of strategic public opinion research. This is the best way for candidates to understand American voters. No candidate will win without it. Unfortunately for political junkies, this sort of research is kept private — and carefully guarded — by the candidates. No surprise: this work makes up the strategic core of their campaigns. Horse race polling will not go away — we understand that. We just want to make sure it is viewed for what it is: an unsatisfying sugar rush.